MANILA, Philippines - Thirty-six year old show Eat Bulaga captured the noontime crown Saturday, October 24, 2015 with its AlDub 'Tamang Panahon' charity concert event at the Philippine Arena in Bocaue, Bulacan. BATTLE OF NOONTIME SHOWS. Eat Bulaga staged 'Tamang Panahon' concert (Photo: Eat Bulaga Facebook). It's Showtime capped off 6th anniversary (Screengrab from Facebook video). 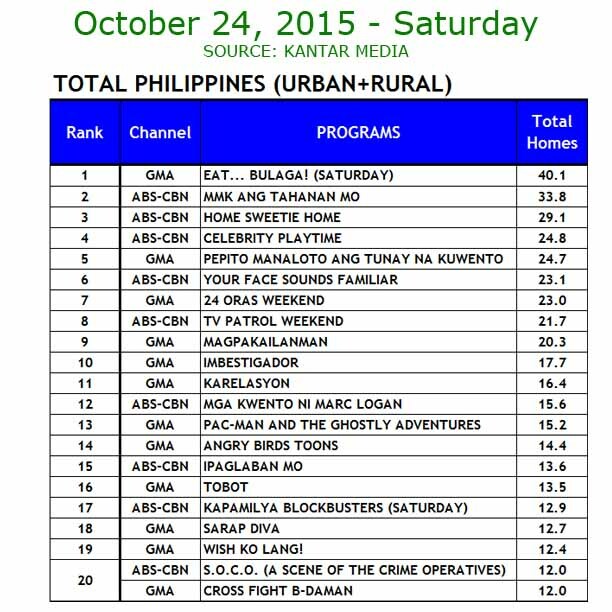 Ratings provider Kantar Media said that Eat Bulaga got 40.1% national TV ratings to topple ABS-CBN's It's Showtime which received 10.2% . The Kapuso noontime show was able to get additional market share while the Kapamilya show is a little below its average viewership level. Eat Bulaga on its Saturday episode has no commercial break for the most awaited encounter of today's fast-rising loveteam of Maine 'Yaya Dub' Mendoza and Alden Richards or AlDub while It's Showtime is on regular programming for its sixth anniversary special. The grand fans day of AlDub at the world's largest indoor arena was jampacked with 55,000 live audience enough to reach the ticket sales of P14 million for Eat Bulaga's Library Project nationwide. #AlDubEBTamangPanahon also pulled in a record-breaking 41 million tweets to steal record from #WorldCup Brazil vs. Germany for the most popular hashtag. Meanwhile, Vice Ganda as he capped the #ShowtimeAnimversary became controversial with his statement over the show's supposed competition with rival program. Vice said they will not be able to beat Eat Bulaga but addressed to stop squabbling on social media who is the number 1 noontime show. From Monday to Thursday national TV ratings, Eat Bulaga and It's Showtime maintain close gap due to the latter's 'Magpasikat Week' of which Vice's Team ( with Jugs and Teddy) won the title for their mind-bloggling performance. 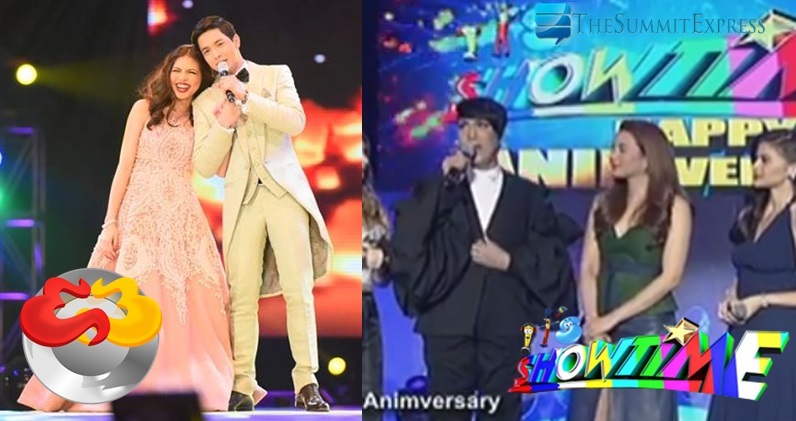 In a report from other ratings provider, AGB Nielsen says #AlDubEBTamangPanahon got a whooping 50.8% TV ratings while #ShowtimeAnimversary registered a TV rating of 5.4% in Mega Manila. 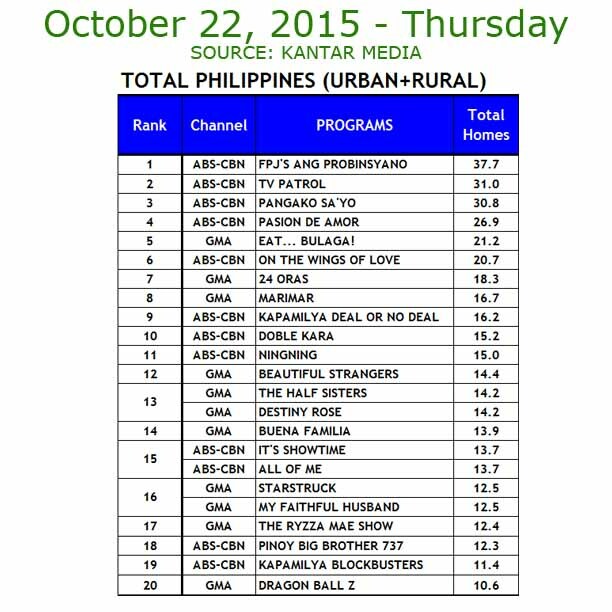 On the other hand, “Ang Probinsyano” continues to rule the country on weekdays. 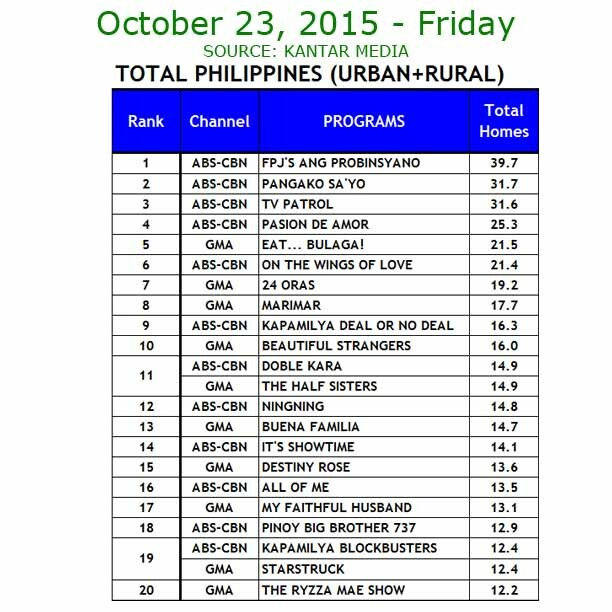 The Coco Martin-starrer hit 39.7% last Friday versus rival with only 17.7%.